for fill the available vacancies in Agra/Hardoi Region. 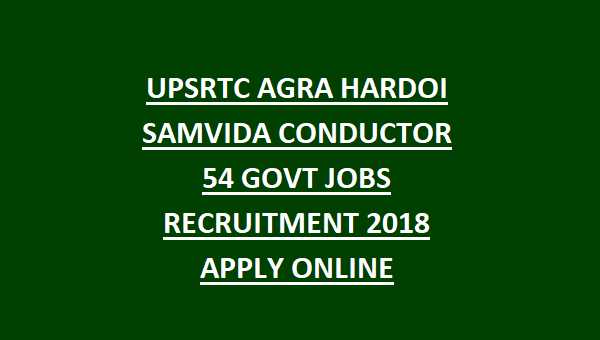 There are total 93 posts in Agra region and 54 posts in this Hardoi Region UPSRTC Samvida Conductor Jobs recruitment 2018. Last date to submit the application form online is 30-10-2018. Applications will be received via online only. Preference will be given to the Agra/Hardoi respective region local candidates. This UPSRTC Agra/Hardoi Samvida Conductor Jobs recruitment is contractual based only. Interested candidates can submit their application for this UPSRTC Agra/Hardoi Samvida Conductor Jobs Recruitment 2018 before the closing date. 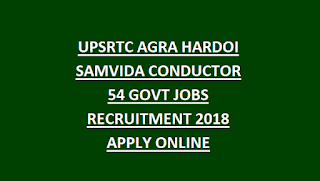 For more information regarding this Agra/Hardoi UPSRTC Samvida Conductor Jobs recruitment 2018 see the details given below. Follow us on Twitter @govtjobonline. There are total 147 vacancies available in Agra/Hardoi Region of UPSRTC. Intermediate qualification is required for all the candidates. Selection for this UPSRTC recruitment will be conducted based on personal interview only. After screening the applications initially eligible candidates will be called for the interview. Preference will be given to the merit candidates. Height: The candidate must have taller than 5.2 Feet. The SC/ST candidates have to pay Rs.100/- and OBC/General candidates Rs.200/- towards application fee through the online payment using net banking or credit or debit card at the time of online application. Follow us on Google Plus @ +Govtjobonline. The candidates who meet the eligibility conditions they can apply online on or before 23-05-2017 by 05:00 PM. Candidates have to apply through the UPSRTC Recruitment website @ http://www.ayushicomputers.org/form.aspx and fill the mandatory details. Must have upload the Candidates photo, Inter and 10th mark sheets. And also upload if any specialization certificates like Home Guard, ITI, NCC B certificate, Computer Knowledge, Scout and Guide etc. Click here to apply online for the UPSRTC Agra/Hardoi Samvida Conductor Recruitment 2018. Click here for official notification of UPSRTC Agra/Hardoi Samvida Conductor. Please share this UPSRTC Agra/Hardoi Samvida Conductor Recruitment 2018 information with your friends.